EXIT Tribe 2019 bestaat uit vijf evenementen op vijf verschillende locaties in vier landen: Sea Star Festival op 24-25 mei, Revolution Festival in juni, EXIT Festival op 4-7 juli, Sea Dance Festival in augustus en No Sleep Festival in november! EXIT Freedom 2018, de editie van afgelopen zomer, vierde meer dan ooit de vrijheid. Een vrijheid waarvoor bijna 20 jaar terug gestreden werd met een honderd dagen durend studentenprotest tegen Slobodan Milošević. Meer dan 355.000 bezoekers kwamen naar de festivals in vijf landen. De volgende stap in de EXIT missie is EXIT Tribe 2019. Een nieuwe gathering die fans, maar ook invloedrijke personen, artiesten, sporters en andere publieke personen, bewegingen en organisatie uitnodigt met één duidelijk doel: bescherm de aarde en al het leven erop! After a thrilling mountain atmosphere and a short break, the time comes for a visit the stunning Croatian coast and the third edition of Sea Star Festival held in Umag, in May 2019. Following two very successful festival editions, Stella Maris lagoon will once again become a favorite destination for a perfect summer start. Festival fans are eagerly waiting for another Sea Star edition, for its lineup packed with great international and local acts, as well as the crystal blue waters, unforgettable parties with friends and exploring the narrow streets of old town! Sea Star has so far welcomed a great number of superstars such as The Prodigy, Paul Kalkbrenner, Fatboy Slim, Dimitri Vegas & Like Mike, Hurts, Robin Schulz, Paul Van Dyk, with 2019 names to be announced soon! EXIT Tribe caravan is arriving to Romania, bringing the magical atmosphere of R:EVOL:UTION festival, which gathered more than 25,000 visitors last year thanks to a lineup that included Gogol Bordello, Dub FX, Wilkinson, Filatov & Karas, Nicole Moudaber, Raresh, Marko Nastić, Ion Ludwig (live), Herodot and many more. R:EVOL:UTION is held in the fairytale-like Village Museum in Timisoara, where a beautiful nature park transforms into a 72 hour party zone, with thousands of visitors enjoying the stellar music program, numerous daily workshops and artistic installations on more than 10 festival stages and zones. EXIT Festival on the world famous Petrovaradin Fortress will once again become a place of musical pilgrimage for visitors from over ninety countries around the world! The festival, that has been among the top European and world music festivals for years, will bring top hitmakers and music scene legends to its Main Stage in 2019. The festival is famous for the sunrises on its colossal mts Dance Arena, as well as for a diverse music program on over 40 different music stages and zones all around the Fortress. 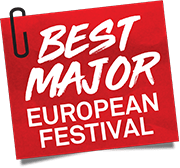 In 2018, EXIT was voted Best Major Festival at the European Festival Awards in Groningen, Netherlands, which is a title the festival already won in 2014. EXIT team festivals are nominated in a record-breaking eight European Festival Awards categories this year. The second sea chapter of EXIT Tribe venture will take place at Sea Dance Festival on the sandy beach of Buljarica in Budva, Montenegro. A stunning destination, the more than 2km long Buljarica beach is a pearl of untouched nature in the Mediterranean. An arc of soft sand and pebbles, backed by a deep-shade forest makes this beach in Montenegro an oasis of green. At the European Festival Awards in 2014, Sea Dance won the title of Best Medium-Sized Festival, while it has been shortlisted in the same category ever since! This year’s artists include David Guetta, Robin Schulz and Ofenbach, and there are a lot more names on the way. No Sleep Festival is the youngest member of the EXIT festival family and the last chapter of EXIT Tribe 2019. Its second edition will feature dozens of artists in multiple venues for a sleepless weekend in Belgrade. No Sleep Festival takes place on more than 10 locations, while the main event is held at the colossal Main Hangar in the Port of Belgrade with its industrial setting contrasted by Europe’s largest river Danube. The debut edition was held in 2018 from November 15 to 18, gathering a crowd of more than 25,000 people from 30 countries. The lineup included Fatboy Slim, Nina Kraviz, Cassius, Lee Burridge, DJ Tennis, Marcel Fengler, Francois X, Dax J, I Hate Models, Randomer and many more. No Sleep Festival also features daytime parties, workshops and exhibitions, along with a music conference with topics that discuss current trends in the industry, featuring exciting international and local speakers.